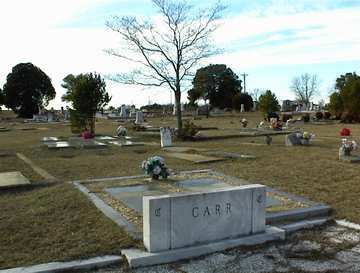 For the most part, this cemetery has been indexed using only birth and death years, although, for many persons, the birth and death month and day are inscribed on the stone. Pfc. 8th Inf. 4 Div. d. before 1938 since she occurs in the TT book. on same stone as Charlie P. Knowles, Sr.
"Nurse 53 years to mankind"
d. before 1938, since her name appears in the TT book. w/o Rembert Brooks, Sr. w/o Benjamin Ray Roberts, Sr.
Co. D. 5th Ga. Res. Born Dublin Ga., First name, date and birth place, service info, per RCSG. Chancellorsville, VA on May 3 1863. Georgia TEC5 Co. B 504 Pioneer Inf. TEC 5 Co. I 36th Infantry Regt. Age 10. d. before 1938, when she appears in TT. born Hancock Co and service info, per RCSG. d/o Mr. and Mrs. F.P. Lingold Other Lingo(u)lds nearby spelled with "u". John W. "Bud" Jenkins, Jr.
"She hath done what she could." d. 1907? w/o S.D. Dubose Marker is broken at the death year. first initials could be M.E. born in Washington Co, GA and service info, per RCSG. Middle name "Bell" from obituary. A Mason. All info per obituary in Union and Recorder, Nov 11, 1879, p. 3. Buried somewhere in this cemetery. Lost his arm in the War, per obituary.